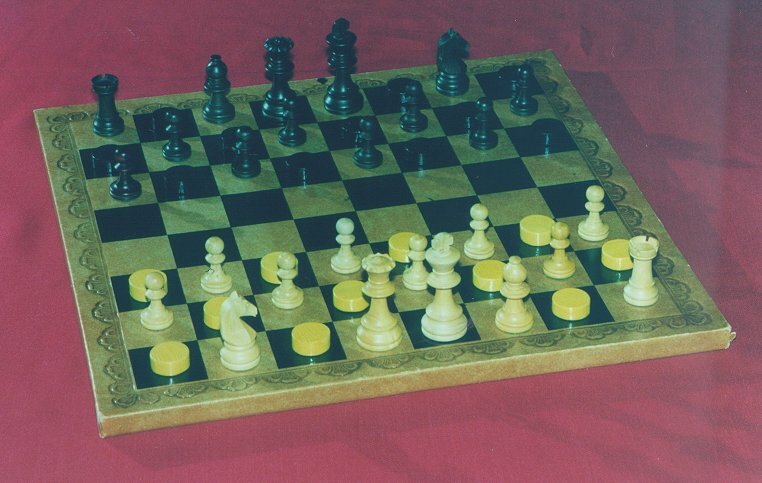 The game Byelorussian Cheskers was invented by N. N. Grushevsky and P. A. Shkludov in 1984. The second author has published some problems for the game in newspapers in Minsk in the mid-eighties. The game is a crossover between chess and Russian draughts (checkers). The game is played by two players on a normal chess board. Each player has a king, a queen, a rook, a bishop, a knight, eight pawns, and eleven draughtsmen. The chess pieces move like in orthodox chess. The draughtsmen as in Russian draughts, which means: they move without capturing one square diagonally forwards, and they capture by jumping over the captured piece to an empty square two diagonally. Taking can be forwards or backwards, following the rules of Russian Draughts. When a draughtsmen reaches the last row, it promotes to a Damka. Damka's move without capturing like a bishop - when they capture they go over a diagonal, jumping over an enemy piece and no other pieces to an empty square. Capturing by a draughtsman or a damka is compulsory. However, when there are different alternative captures, the player can choose which capture to make. In addition, when a draughtsman or damka has made a capture in a move, and that piece must then make another capture, this capture is also carried out in the move - in this way, a piece can make a whole series of captures. The player must make a capturing move that takes the largest number of pieces. When a draughtsman reaches the last row by a capture, it can take other pieces as a damka after that - and must do so, when possible. However, pieces are considered to be away from the board only after the entire move has been done. Capturing by a draughtsman or damka has precedence over lifting check. Hence, when the king of a player is checked, but he also has a capturing move with a draughtman or damka and no such capturing move lifts the check, the king is considered checkmated. The player that checkmates the king of the opponent wins the game. Stalemate, check, etc., are as in usual chess. Below, you see a picture of the board, sent by Jean-Louis Cazaux, and made by Jean-Luc Muraro. Click on it to see it in larger size. The Encyclopedia of Chess Variants, by David Pritchard. Written by Hans Bodlaender. Photo by Jean-Luc Muraro. "Capturing by a draughtsman or a damka is compulsory. However, when there are different alternative captures, the player can choose which capture to make." In theory, by logic capturing with draughtsman or danka should be forced even if the other pieces are possible to capture. In draughts pieces have forced capture while in chess they dont: So you can: 1-Assume this is a rule of draughts and while doing a crossover with chess and so do A or B: A- use this rule (all pieces have forced capture) B - not use it (and so use the chess rules, no pieces have forced capture). OR 2-Assume this is a rule of the draughts pieces, and so only the draughts pieces will have this rule. He assumed 2 (since the draughts pieces have forced captures and the chess ones dont). So, this would means draughts pieces MUST capture if possible, period. Author: Hans L. Bodlaender. Inventor: N. N. Grushevsky.